WRITER-DIRECTOR Darren Aronofsky is noted for his disturbing, surreal films. As a real auteur, he first gained fame in 1998 for the low-budget psychological thriller, “Pi”, a study in mental obsession, followed in 2000 by “Requiem for a Dream”, which gave an Oscar nomination to lead actress Ellen Burstyn. His third film, “The Fountain” in 2006, about a man, Hugh Jackman, who resorts to time travel to save his loved one, got mixed reviews. In 2008, he gave Oscar nominations for Mickey Rourke and Marisa Tomei in “The Wrestler”. He finally made someone win the Oscar in 2010, Natalie Portman as best actress for “Black Swan”. In 2014, he did the Biblical epic, “Noah”, which became his most successful at the box office. He now comes up with “Mother!”, a work more puzzling than anything he has done before. Local viewers who just want to be entertained by simple-minded romcoms will surely be turned off as Aronofsky seems quite determined to intentionally baffle and outrage his viewers. Surely, some folks will love it, but there are more viewers who’ll be apalled and hate it. The characters here have no names. The setting is set in a remote location where a Victorian house stands alone and seems isolated from the rest of humanity. A young woman (Jennifer Lawrence) is married to a much older man (Javier Bardem), a poet who’s currently having writer’s block. She’s renovating the house by herself after it was gutted by a fire. Their doorbell rings one night and an old man (Ed Harris), who claims to be a doctor and a fan of the husband, comes in. Javier asks him to stay, much to the amazement of Jennifer since he’s a total stranger. Soon, his wife (Michelle Pfeiffer) arrives, followed by their two sons who are fighting each other (real life brothers Brian and Domhnall Gleeson) over their dad’s will. The invasion of their privacy is aggravated when one brother kills the other one, with unwanted guests arriving later to condole with the couple for losing their son. After this chaotic first half, a short period of calm follows with Jennifer getting pregnant and delivering a baby, then the second cycle of hellish nightmares begin. Javier has finished a new book and his fans intrude on their home, leading to an unspeakable act which we won’t describe as that will be a sure spoiler. No doubt some viewers will find this revolting and we won’t be surprised at all if others will say it makes no sense at all. It reminds us of David Lynch’s similarly cryptic films, like “Mulholland Drive”, where you can’t figure out whether what’s going on is real or just a hallucination. We don’t know how you’ll take the film but it’s apparently an allegory. We thought at first it’s something like Polanski’s “Rosemary’s Baby”. 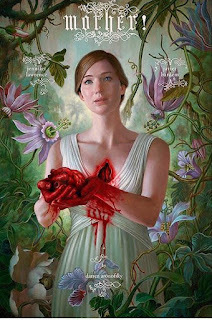 But judging from all the insanity, we think Jennifer signifies Mother Nature or Mother Earth, and the intruders are us, people who assault our environment and abuses her hospitality. Ed and Michelle are Biblical references to Adam and Eve who intrude on the garden of Eden and upset it, with their sons standing for Cain and Abel. It also touches on Gaia philosophy about the survival of species. The film opens with Jennifer looking at the audience as fire consumes her, after which we see Javier putting some kind of gem or crystal on a stand. You’ll figure out what these things mean at the film’s climax but, generally, what is happening on screen is not everyone’s cup of tea. Technically, you’d be astonished how the movie is expertly staged, from the way the house is constructed and photographed in 16mm. film, with the camera stalking Jennifer in so many meaningful close ups and extended long takes that assault the viewer. This is intended to instill a sense of dread and claustrophobia in chronicling Jennifer’s horrified reactions to all the intrusion, abuse and mayhem going on around her done not by zombies or monsters but supposedly everyday normal people. Aronofsky practically throws everything at the viewers, including the kitchen sink which “pasaway” guests destroy right in front of Jennifer. Definitely, this is the least accessible of his films, even more of a conundrum than “Black Swan”. Javier, Michelle and Ed give excellent support to Jennifer. 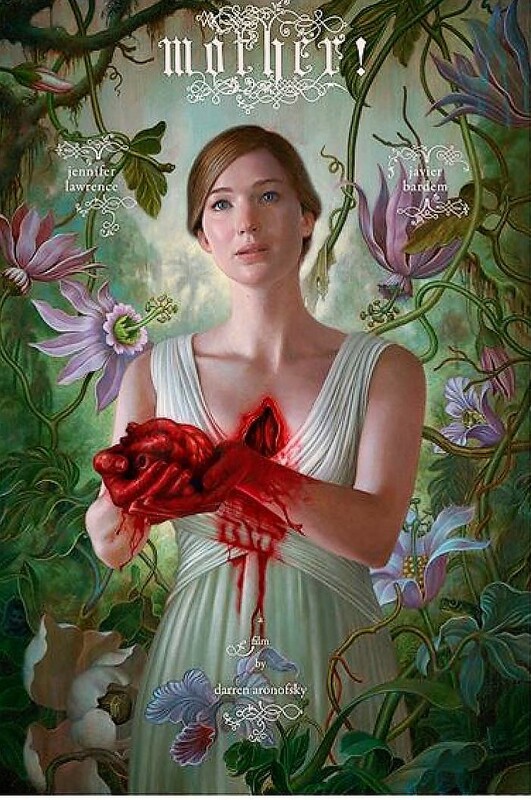 But it looks like Jennifer herself doesn’t have full grasp or understanding of her very difficult role as the only seemingly normal person in very insane surroundings. It’s really a taxing and difficult character that needs someone with a more forceful screen persona which will enable her to connect more effectively with the viewer. Here, the 59-year old Michelle easily steals scenes from Jennifer without much trying to. Also, the film is too long at two hours. There are scenes that have already made its point but still go on for far too long. It’s an ambitious work but it’s not for every moviegoer as you don’t get to be truly invested in all that is happening on screen.